Working on Tom Tom was a bit of an odd stroke of luck. A friend of mine, Fiona Campbell, who has drummed for The Vivian Girls amongst many other fantastic bands, gave me the heads up some five years ago about a new magazine being started exclusively for female drummers. It was one of those "why doesn't this already exist" moments for me. Having been in the percussion section of marching and symphonic bands from the fifth and tenth grade and having played in live bands since middle school, I was always sensitive to and disappointed by the way female drummers would so often be weeded out, seemingly always relegated to playing the bass drum or mallets. I don't know if Fiona knew this or just that I was a drummer and a writer, but I knew I had to get involved and she shared my information with Tom Tom's editor and founder, Mindy Abovitz. Fast forward a couple years, and Tom Tom was nearing its tenth issue when I finally met Mindy IRL at a craft convention in Brooklyn and she surprisingly remembered me, and reiterated her interest in bringing me on to guest edit an issue on electronic music. This time I actually followed through and a few months later, I was helping Mindy select artists to profile while helping her with interviews with Santigold and a still on-the-come-up Grimes (who would release her breakthrough that same spring). I was able to work in personal favorites like Pursuit Grooves and Nguzunguzu, and penned the opening introduction for the section alongside a selection of 'artists to watch' (many of which that were actually pretty prescient looking back on it some 4 years later). 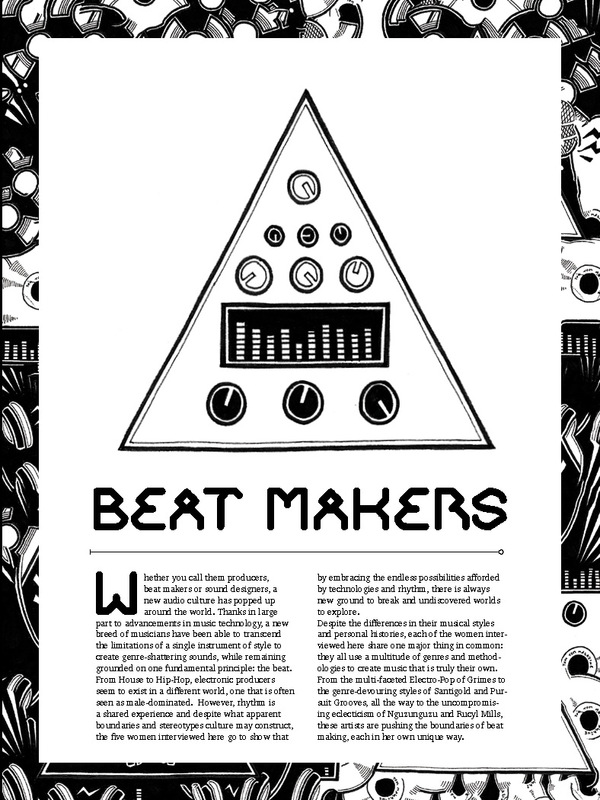 Below is the cover along with some selections from the Beat Makers Issue, though my feature on Nguzunguzu and a book review on Pink Noise are not included below...should figure where those are! This was a wonderful project and something I hope to work on again some day...Mindy has a way of turning passing promises into present realities. This selection could have alternately been called "All the Artists Nick Wanted To Cover This Issue But Couldn't." Stoked that many of the artists on the list have all achieved considerable success and are still relevant today. This was actually a pretty easy piece to write given the fact that I was a genuine fan of Vanese's music and she was so friendly in our correspondence, so it wasn't much of an effort in communicating what I found interesting about her and her music.